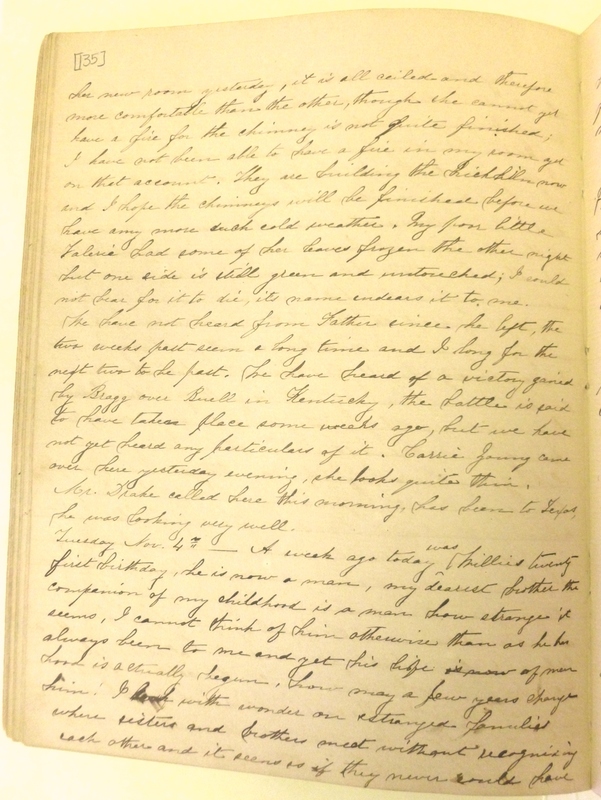 Item description: Entry, 15 October 1862, from the diary of Sarah Lois Wadley. Sarah Lois Wadley was born in 1844 in New Hampshire, the daughter of railroad superintendent William Morrill Wadley (1813-1882) and Rebecca Barnard Everingham Wadley (1819-1905). Although born in New England, she appears to have been raised in the South, and lived with her family in homes near Amite in Tangipahoa Parish, Monroe and Oakland in Ouachita Parish, La., and near Macon, Ga. Sarah Lois Wadley died unmarried in Monroe County, Ga., in 1920. Item citation: From the Sarah Lois Wadley Papers, #1258, Southern Historical Collection,Wilson Library, University of North Carolina at Chapel Hill. I had a quantity of cover. Sunday it was still cold, and froze again that night. Monday we could not have school on account of the weather, today it is quite pleasant, but is still cold. I spent Saturday with the Misses Compton, passed a very pleasant day, in the evening Col. Gibson, from Mallison Parish, who has been up at the salt works making salt, came in, he is a very pleasant gentleman indeed. Mrs. Dwight moved into her new room yesterday, it is all ceiled and therefore more comfortable than the other, though she cannot yet have a fire, for the chimney is not quite finished; I have not been able to have a fire in my room yet on that account. They are building the brick kiln now, and I hope the chimneys will be finished before we have any more such cold weather. My poor little Valeria had some of her leaves frozen the other night, but one side is still green and untouched; I could not bear for it to die, it’s name endears it to me. We have not heard from Father since he left, the two weeks past seem a long time, and I long for the next two to be past. We have heard of a victory gained by Bragg over Buell in Kentucky, the battle is said to have taken place some weeks ago, but we have not yet heard any particulars of it. Carrie Young came over here yesterday evening, she looks quite thin. Mr. Drake called here this morning, has been to Texas, he was looking very well. 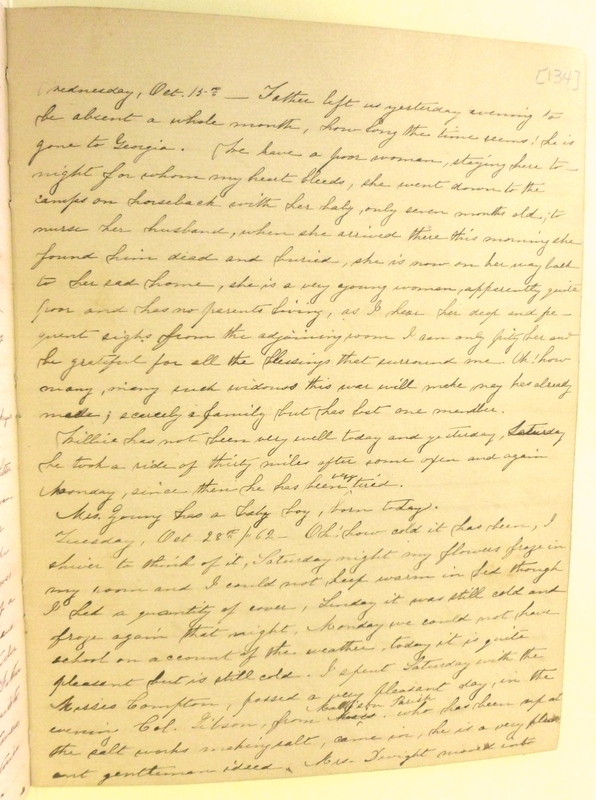 This entry was posted in Southern Historical Collection and tagged diaries, Sarah Lois Wadley, women. Bookmark the permalink.